The first truly comprehensive building operations platform for the commercial real estate industry. What is a Building Operations Platform? There are a range of activities necessary to keep commercial real estate portfolios running and tenants comfortable. These activities have direct and indirect costs in the form of maintenance labor, outside vendors, utility bills, administrative staff, and equipment capital investments. A building operations platform is a collection of data-driven tools to streamline these processes, eliminate waste, and maintain tenant health and comfort. The Enertiv platform is organized into solutions based on overarching goals. 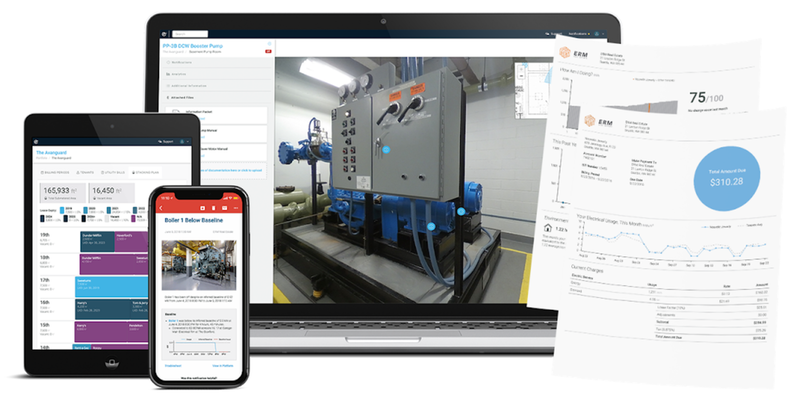 Enertiv 360 is a digital twin technology that embeds real-time data and documentation into a detailed replica of every critical system in a building. Enertiv’s asset intelligence solution delivers maintenance notifications, identifies money-saving insights, and enables data-driven capital investment decisions. Enertiv ATB is a submetering solution that leverages remote meter readings to streamline the tenant submetering process, ensure faster revenue recovery, eliminate errors, and provide full transparency for management. Real-time and predictive fault detection reduces equipment downtime and prevents the worst effects of leaks and other issues. Build a foundation of data to unlock additional services and revenue streams, and become your own IoT solution provider. Deploy a building monitoring system to Improve efficiency with low and no-cost optimizations and streamline energy-related paperwork.